The site team at Howdens, Warth Park were able to turn site scrap into musical instruments for the children at Kings Heath Primary Academy. The materials used were recycled and made safe to create instruments for a sound garden based in the school’s playground. 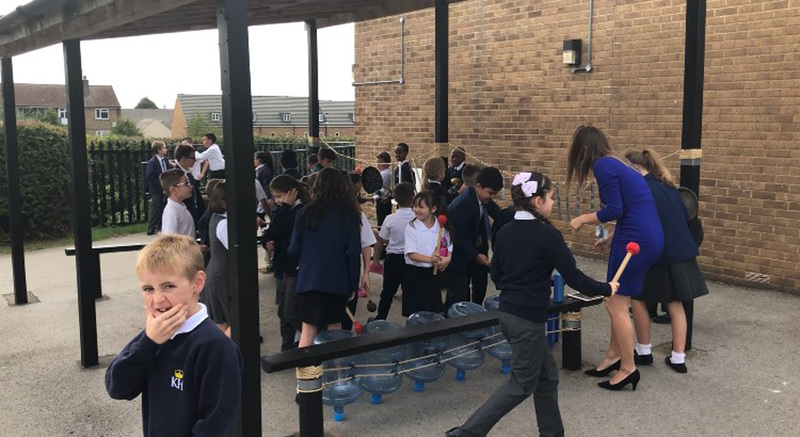 The sound garden is available to all the children at Kings Heath Primary Academy during break times and lunchtimes and is proving an overwhelming success. The sound garden will enable children to enjoy experimenting with the instruments, making and changing sound, releasing their creative flare whilst enjoying the fresh air. The School’s principal has already noticed that the combination results in children walking back into their classrooms ready to learn and much more engaged as a result.